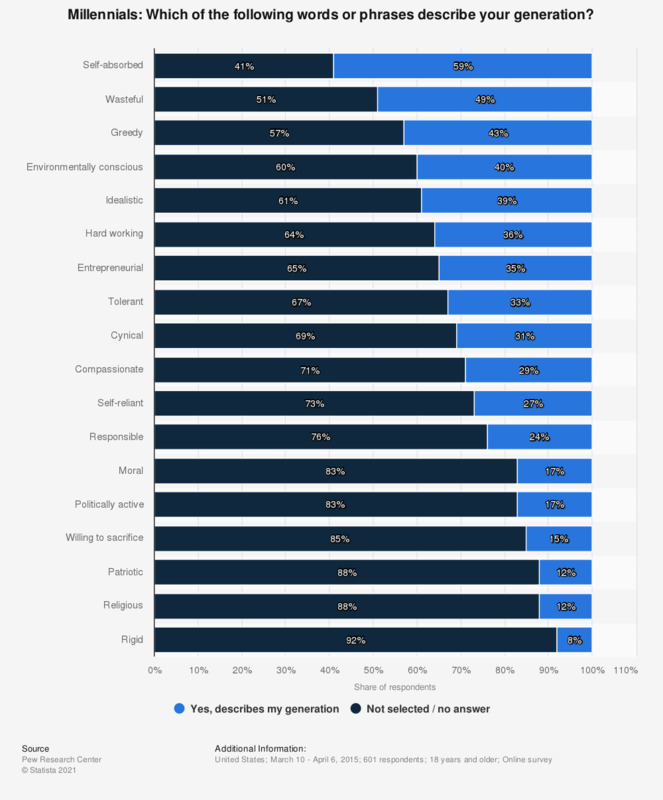 This statistic shows the results of a survey completed in 2015 among American Millennials regarding personality characteristics of their own generation. In 2015, 59 percent of surveyed Millennials responded that they consider their generation self-absorbed. Further results show that 49 percent believe that they are wasteful and 43 percent describe their generation as greedy. Millennials tend to be critical of their own generation, associating a number of negative traits with it, like self-absorption, wastefulness and greed: 59 percent, 49 percent and 43 percent of Millennial respondents identified with these characteristics respectively. However, they also consider themselves to have some positive characteristics: 41 percent of Millennials use the term “environmentally conscious” to describe their generation, “idealistic” follows with 39 percent, “hard working” with 36 percent and then “tolerant” with 33 percent. It is interesting that Millennials consider themselves to be both environmentally conscious yet wasteful at the same time. When it comes to greed, Millennials have grown up with a weaker economy, having found it more difficult to find work, and typically have more debt than other generations. Almost as many people in their 20s have education loan debt as they do mortgage debt, and any spare cash Millennials have typically gets put into savings and to pay off debt on credit cards and loans. But they also like to spend their spare cash on new clothes. Student loans, educational and other are their biggest financial concerns. Many Millennials tend to also be concerned about their daily expenses. All in all, Millennials struggle more with financial problems than previous generations, but they also seem a lot more flexible when it comes to finding solutions. This question was phrased by the source as follows: "Thinking about people in your generation overall, which of the following words or phrases describe your generation?" How confident are you that the following is correct? : Inside our cells, there is a complex genetic code that helps determine who we are.